Don't mind me, I'm just feeling bitter that the folks at Capcom have thus far failed to bring the original Monster Hunter Diary--released in Japan last August--to North America. 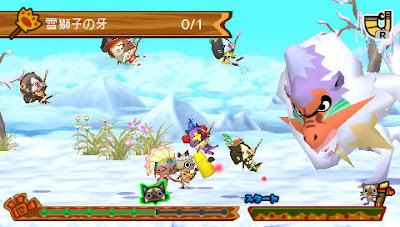 I know, this Animal Crossing-esque PSP title likely would have sold all of five copies (if the folks at Capcom were lucky) in the States, but one of them would have been sold to yours truly--which of course makes me believe its release would have been completely worthwhile. Anyway, while a handful of North American gamers like me continue to wait in vain for Capcom to bring the game to our region, the Osaka-based company will be releasing its sequel--called Monster Hunter Diary G--in Japan on Aug. 10.
Who knows, maybe this one will be localized and released as a download-only title when the NGP--which will reportedly be called the PS Vita--launches later this year or early next? That would be nice, wouldn't it? I'm so sick of developers and CEOs telling us what we would or wouldn't be into if it were localized. Yeah, it's too bad more companies don't give us a chance to show them we like quirky titles like this one. Of course, I'm guessing the folks at Capcom have a couple of good reasons for shying away from releasing this one outside of Japan: 1) the PSP is not a a very popular system in the States and 2) past Monster Hunter games haven't sold very well here, either.